By popular demand we’ve added a project Calendar to Basecamp! 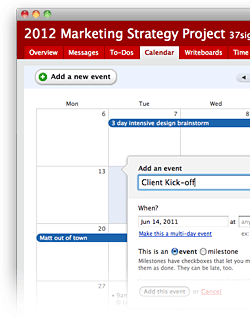 Now you have a bird’s-eye-view of your project schedule and important deadlines. Make sure everyone knows what’s happening when. “9am Team breakfast”, “Project Phase II kickoff”, “Client presentation next Wednesday”, “Project Launch on Friday”. Everything’s in the Calendar so you don’t miss a beat. You can even set up events that span multiple days—a week-long conference or meeting, for instance. Multi-day events can also be used to label different project phases—Phase 1 or Phase 2. This helps you visualize how long the project will take. Get a 14-day project overview. The 14-day view on the Dashboard and Overview screens has been updated with the new Calendar view too. 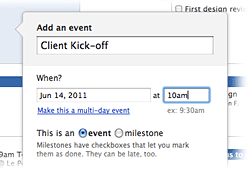 Here’s a real bonus: You can now update or add events to your project schedule right from the Dashboard. See what’s on your Agenda. 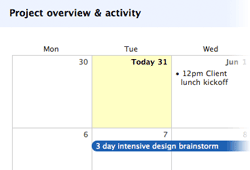 The Basecamp Calendar also has an Agenda view. 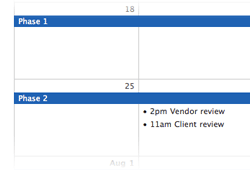 The Agenda presents your project schedule in a neat chronological list. It looks great when printed out on paper too! 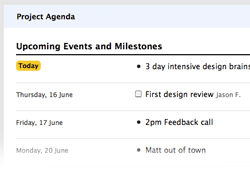 Basecamp’s Project Agenda is the perfect companion for your status report. Sign up for Basecamp to start using the brand-new Calendar. Over 8 million people use our web-based products to get things done. You’re receiving this email because you signed up for a 37signals product. View it in your browser. If you don’t want to receive this newsletter anymore, you can unsubscribe.